The curtain has closed on another year and it was a quite remarkable one for PRO’s Joe Fletcher, but the assistant referee won’t be letting his standards slip in the offseason. The 38-year-old’s highlight was officiating at the FIFA World Cup in Brazil, alongside Mark Geiger and Sean Hurd, and he also ran the line at the MLS Cup Final to cap off 2014 in style. 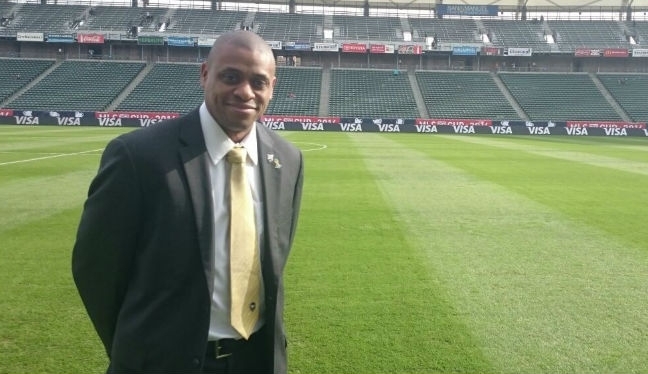 “This has been my best ever year as a referee,” Fletcher, who was assigned to nine MLS regular season games before the postseason showdown at StubHub Center, reflected to proreferees.com. “The World Cup being a large part of that, but even domestically I’m really pleased with the guys I’ve had a chance to be with in MLS. Fletcher has already turned his attentions to next year and how he can follow the experiences of 2014, highlighting the drive and determination that he possesses. Along with his PRO colleagues, the AR will be able to maintain a good physical condition over the close-season, with the help of the Organization’s Sport Scientist Matt Hawkey. But it isn’t all work and no play, as the official from St. Catharines, Ontario, is looking forward to spending time with his family back home. “Family time will be top of the list during the holiday season. I’ll take a fair bit of time off to let the body rest and recover. “We can’t be in peak condition all the time but I will be using the same plan that Matt Hawkey gave me last year. It was one month in duration, and it was perfect as I was more than ready for the PRO fitness test at the end of January. “I would always do something over the close-season but under the guidance of PRO I now realize my ‘something’ wasn’t nearly as effective as what Matt puts together. “Staying fit is easy during the season as you’re doing matches and the weather is nice. Our offseason is much harder to navigate that way, so Matt’s efforts are greatly appreciated in the winter. “It’s vital to not become lazy. I get no free-bees from MLS teams or PRO – regardless of my past experiences, like the World Cup. “The goal next year is to be consistent. If I want any hope of repeating the success of 2014 I’ll need to be as focused as I was heading into the World Cup.